Is This Bedlington Terrier Good For You? 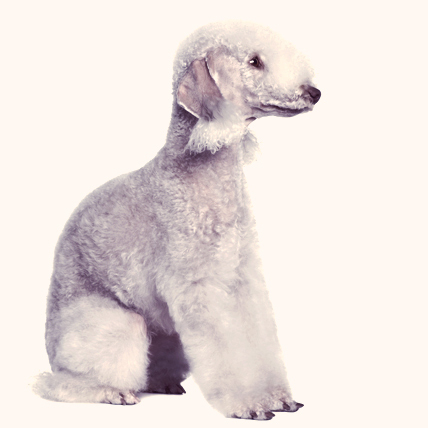 Bedlington Terriers love the companionship of children and make great family pets. This energetic breed is great for someone with an active lifestyle. It is important to socialize Bedlington Terrier puppies otherwise they may show aggression towards other animals. Originally hunting dogs, the Bedlington Terriers were previously known as the Rothbury Terriers. This breed of dog originated in the 19th century and their bloodline can be traced to the crossbreed between a Rothbury and a Bedlington dog with some contributions from Otterhound as well. Careful breeding has ensured that the Bedlington Terriers developed into a more sociable and loving dog. Exhibiting a unique bouncy gait and a most unusual head shape, an adult Bedlington Terrier can generally grow up to height of 15–17 inches, and weigh around 17-23 pounds. The Bedlington Terrier features a somewhat pointed tail. The front legs of this breed are straight. The dog has a thick and double layered coat, and it comes in comes in blue, liver or sandy colors, with or without tan markings over the eyes and on the legs, chest and back. The Bedlington Terrier is a very active and lighthearted breed. They are normally good towards children and love their companionship. This breed of dog is not that good with outsiders and strangers. Socializing is very necessary as they may show aggression towards other animals or family pets. Liver, Blue, Blue/Tan, Liver/Tan, Sandy/Tan. Bedlington puppies often appear white, which is not a show-recognized color for this breed.